← Peach Valley: So much more! Giant Red Paintbrush in Peach Valley. The blossoms are pretty small, making identification tentative. While at Peach Valley on Friday, April 15th, and Saturday, April 16th, these wildflowers jumped out at me. Above you see the giant red paintbrush, although “giant” is a relative word. 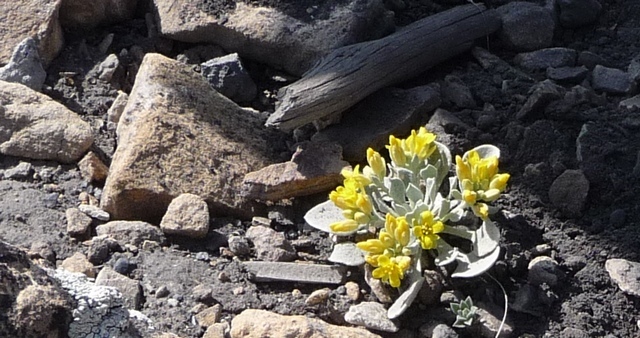 Following is a picture of some cool rocks, then a picture showing Flattop to the south, then a couple more wildflowers. It’s still very early in the wildflower season. 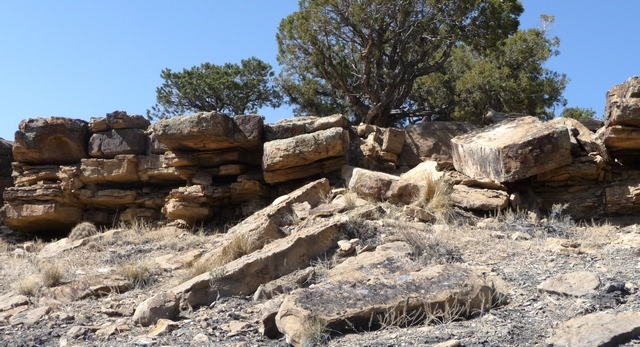 Rocks along Spikes Trail. Unfortunately the trail headed up through these rocks in a stair step fashion. I didn't attempt it, not thinking my Yamaha XT-250 strong enough. The view below looks south toward Flattop. It’s the companion of the view from Flattop looking north that’s in this post here. Alpine Wallflower. Identification tentative because plant is so small. Note unusual leaves--I'm not sure if these morph as the plant grows older. Rocky Mountain Flox. I'm fairly certain of this one. And I’ll close with this lichen. If I’d had my Pentax along, I could’ve grabbed a clearly-focused, richly colored version. But…if I’d had my Pentax along, I certainly wouldn’t have attempted Spikes Trail! 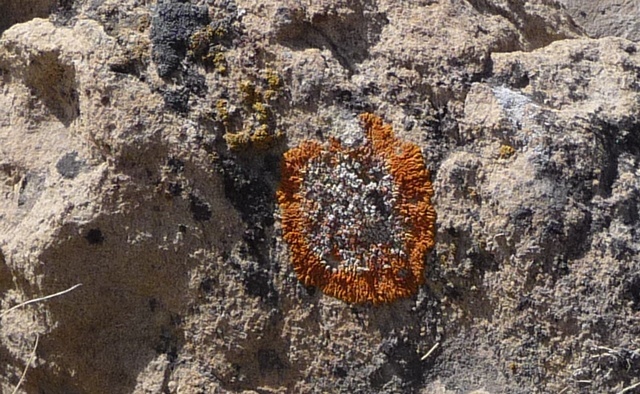 Colorful lichen. The ring is about two inches in diameter. This entry was posted in Montrose County, Wildflowers and tagged alpine wallflower, Colorado, Flattop Mountain, giant red paintbrush, montrose county, rocky mountain flox, wildflowers. Bookmark the permalink.